The character pronounced 'no' in the word 'Mizu-no' (water field) is the particle meaning 'of'. Therefore, the literal meaning is akin to 'of water'. The 'water' part of the word appears as ' Mitsu', in the Shimane district section of the Fudoki: "Mitsu-hama (beach), 1144 feet wide. Dwellings present." The Edo-era publication detailing the Shimane area, the 'Unyoushi' , referred to this area as 'Mizu-ura '(Water bay). In modern times, 'Mitsu' is still used to designate a block within the locality of Kashima town where the shrine can be found. 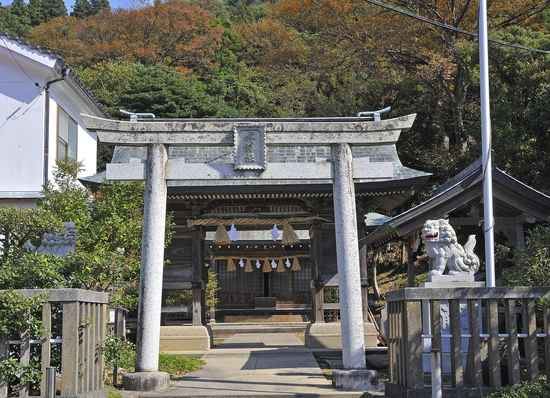 It's commonly thought that the shrine connected to the Mitsu-hama found back in the Fudoki days was called 'Mitsu-yashiro'. However, shrine history says the shrine was originally on a small island where it was known as 'Oshima Daimyojin'. In Meiji 4 (1871), it was renamed as 'Mitsu jinja' and was then relocated to the mainland to an area known as 'Hongu'. There, it merged and was enshrined together with an already existing 'Hongu jinja' and the formation remains as so today. It's interesting to imagine what kind of shrine the original 'Hongu jinja' in the Hongu (mainland) was. In Keio 2 (1866), as part of his extensive fieldwork, local man Omura Shigeyoshi listed this area as 'Mizu no Ura" . References in his notes spoke of a 'Kojima jinja' on Okinoshima island. He also worshipped at Hongu-jinja, but referred to it as 'Mitsu-yashiro'. The enshrined deities at Mitsu-jinja, Izanagi-no-mikoto and Izanami-no-mikoto, are the deities of Hongu-jinja, and the three other deities, Ichikishima Ichikishimahime-no-mikoto, Takirihime-no-mikoto and Tagitsuhime-no-mikoto are the deities at Kojima-jinja. Could this suggest that Ojima and Hongu were enshrined together? Additionally, it is said that there is a white, transparent 'power stone' present in this shrine. 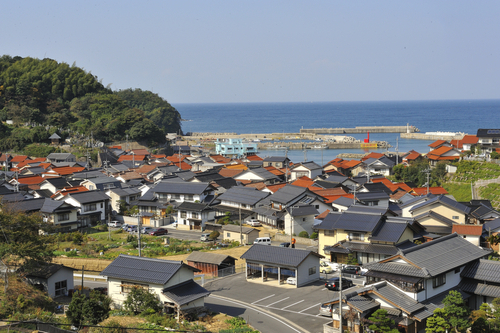 Also present in the waters around Mitsu is 'Mishima' , , well known as a top scenic spot. In Taisho 10 (1926), following a survey conducted by Matsuyo Shimpo (now known as the San-in chuo Shimpo newsaper) to find the 'Top 10 Spots in San-in', Mishima came in first with 73842 votes. The Torii gate for Mitsu jinja can be seen from the side of the prefectural road that heads back to Matsue city from Mitsu harbor after heading east from Kataku Hachimangu shrine in Kashima town. Head north from Matsu hot springs and continue through at the 'Kashima Taku no yuu' intersection then go over the mountain pass. The village will come into view on the lower left. The shrine itself is on the opposite side of the first bus stop you come to. Just as it was written in the Fudoki, the Mitsu-jinja Torii gate is inscribed with the former shrine name, 'Mitsu Yashiro'. The current one, 'Mitsu-jinja', can be seen on a plaque as gets to the Prayer Hall. The name of the Guji (chief priest) of Izumo Taisha is also on this plaque showing the strong connections between the shrines. There are several very old -looking hokura (small shrines) within the grounds of Mitsu-jinja giving the area a very historical feel. At the back of the main hall, is a straw snake representation of Kojin, the god of kitchens, it leaves a strong impression with its piercing red eyes. The Tondo new year event with its smoke filled burning of bamboo sticks to expel troubles is said to represent the return of the gods all clambering over the smoke to get back. The carrying of the portable shrine of Tokitoshisama around the village is a chance to pray for good health and wealth. The Tondo here is said to be a 'fire walking Shinto ritual' where groups carrying two decorated portable shrines run around roaring flames underneath large decorations. It is quite a spectacle to behold.